FLIP: Target 1 Spell in your GY; add that target to your hand. Throwback to one of the original ladies of Yu-Gi-Oh in Magician of Faith. With the game having advanced so far and becoming so quick in comparison to the days of old, MoF has fallen off quite a bit. Flip to get a spell back, that is too slow and considered obsolete when you have a host of other cards that can add a spell back to the hand. Not only that, players would rather use traps to do what Magician of Faith does rather than lose a monster slot in their deck for a monster that has weak stats and doesn’t combo very well with anything nowadays. 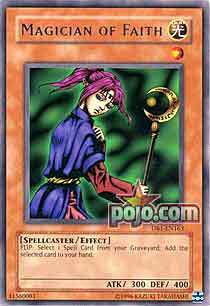 She use to be an important monster, one of the best because of the limited card pool of ways to get a spell back. Now, she’s just a memory of how times used to be. She will always hold a place in Yu-Gi-Oh history for her importance to the game and players will fondly remember her as well. She could still be played today, but not competitively. We look at a once powerful card this week for Throwback Thursday, so powerful it had to be Forbidden, Magician of Faith. Magician of Faith has a FLIP effect that makes you grab a Spell from the grave back to the hand upon being Flipped. Imagine this back in the day with cards like Deliquent Duo, The Forceful Sentry, Confiscation, Monster Reborn, Pot of Greed, Harpie’s Feather Duster, Change of Heart, Graceful Charity. Notice all of those cards are Forbidden now, so there isn’t really anything good to get back with this gal. There are still good options like Raigeki, Twin Twisters, Cosmic Cyclone, and archetypal Spells, but FLIP effects are very slow in the modern era. The Shaddoll monsters needed extra effects to be meta relevant and Subterrors are good, but not overly strong. You set a Magician of Faith and it will leave the field without being flipped most of the time. The years have not been nice to this card, hence why it is at 3. It is ok, but far from the threat it once was. What a cute throwback, no? Magician of Faith is, was, so powerful, she was Banned? How many of you reading this played or remember that? Magician of Faith is just another card that has essentially been lost in Yugioh legend…lore? Flip effects are very difficult to get these days, even something powerful like gaining a Magic card back from your Graveyard. A lot of the best cards she can get are Banned these days, but that should only go to show why she was too in the past. You wouldn’t want someone using HFD or Raigeki on you a SECOND time. Oh, and for an anime note, she was Tea’s favorite card.